With cactus color, start with a magic ring and 8 sc into ring. Sl st in next sc and fasten off. With flower color, ch 2. 6 sc in second ch from hook. Round 1: (Ch 2, work [hdc, dc] in next st, sl st in next st)three times. Fasten off, leaving a tail of yarn. This is to make sure the stuffing doesn't fall out of the bottom hole of the flower pot before you attach the flower pot base. Use any color yarn you want for this because this part will not be visible when your cactus is completed. Starting with a magic ring, 6 sc into ring. 2 sc in each st around. (Sc in next st, 2 sc in next st)twice. Glue this piece to the inside of the bottom of the flower pot to plug the hole in the pot. With flower pot color, start with a magic ring and work 6 sc into ring. Round 7: Sl st in each st around. Fill the flower pot with poly-pellets or stuffing. With glue, attach the flower pot base to the bottom of the flower pot. 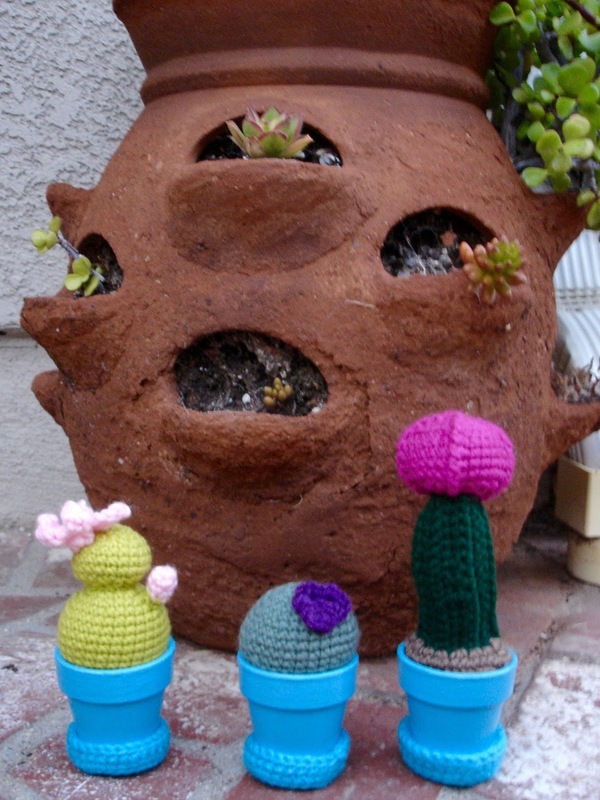 With glue, attach the cactus to the inside of the flower pot. With cactus color, start with a magic ring and 7 sc into ring. With flower color of choice, ch2. 5 sc in 2nd ch from hook. Sl st in first sc and fasten off, leaving a tail of yarn for sewing. Fasten off flower color and attach cactus color by pulling up a loop through the last stitch worked. Sl st in next sc and fasten off, leaving a tail of yarn for sewing. Sew flower bud to cactus. With cactus color, ch 15. Row 3: Sc in BLO of each sc across. Ch 1, turn. Row 7: Sc in each of next 9 sc, 2 sc in each of next 2 sc, sc in each of last 3 sc. Ch 1, turn. Row 8: Sc in each of next 10 sc, dec1 twice, sc in each of last 2 sc. Ch 1, turn. Row 11: Sc in each of next 6 sc, 2 sc in each of next 3 sc, sc in each of last 5 sc. Ch 1, turn. Row 13: Sc in each of next 5 sc, dec1 three times, sc in each of last 6 sc. Ch 1, turn. Rows 14-15: Repeat Row 2. Row 16: With wrong sides together, hold front row to back row and sc down both rows at once. Now you should have what looks like a tube. Sl st in next st and fasten off, leaving a tail of yarn. Use yarn needle and thread tail of yarn through the stitches around the opening of the graft piece. Pull stitches to cinch and match the size of the opening of the cactus piece to the size of the opening of the graft piece. Fill with stuffing and sew both pieces together. Attach soil color to the cactus piece by pulling up a loop anywhere along the bottom ring of the cactus. 2 sc around base of cactus. Work a few rounds sc in each st around. Add more stuffing, if needed. With glue, attach this part to the inside of the flower pot. What a beautiful garden! Thank you for sharing!